At nine months, babies are also becoming experts at quickly changing position. They can push up to a crawl position, sit back down, and pivot to pick up a toy. Your little one may even be able to pull to a stand, and may soon start cruising around the room while holding onto furniture. Although those tiny baby shoes might look enticing on the store shelves, you don’t need to invest in shoes until your baby actually starts to walk or is spending lots of time outdoors. For now, barefoot is best when indoors. Standing and walking in bare feet helps him develop the muscles and tendons in his feet. It’s also easier to grip the floor in bare feet. When it gets cold outside, socks with non-skid bottoms will keep your baby’s feet warm. In addition to getting ready for walking, 9-month-old babies are also improving their fine motor skills. With their pincer grasp, they’re able to pick up smaller toys, and they can better coordinate the movement of both hands. These little sleuths will use their newfound motor skills to try to figure out how everything works — which peg fits in the round hole, how cups fit inside one another, and which end of the toy telephone goes over their ear. Just make sure the toys they are playing with aren’t a choking hazard. 1 What Should My Child Be Doing at 9 Months Old? 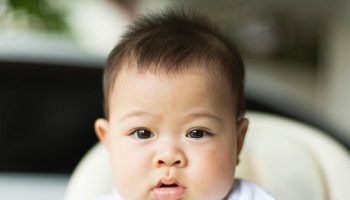 What Should My Child Be Doing at 9 Months Old? At 9 months, a baby is usually very attached to her parents and caregivers. She may fuss if a parent leaves the room. She may draw away from strangers and be resistant to what others want her to do. Around this time, the baby will start to imitate others in her behavior. She does not always play nicely with other babies. This is because she does not recognize others as equals. At this age, she needs to feel that someone is there to care for her. She enjoys social games such as peek-a-boo. A baby at 9 months is able to crawl and may begin to walk. He may take steps while holding onto a table or sofa. He may also try to climb up stairs. At 9 months, an infant will put hands forward while pointing head down, to keep from falling. Typically, he can sit for long periods of time and can pull himself up to a standing position. He learns to let go of objects with his hands and puts everything in his mouth. He can pick up small objects with his thumb and index finger, which allows him to feed himself. He will shake or throw toys. 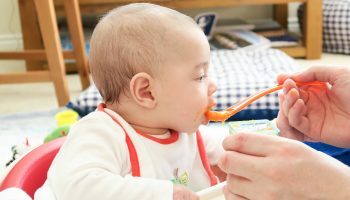 The 9-month-old child will make sounds such as “da-da.” Such babbling, which is a combination of consonant and vowel sounds, later leads to formal words. 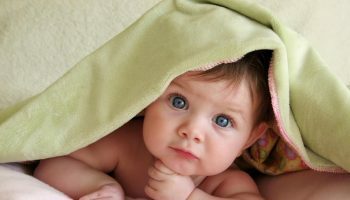 A baby at 9 months will respond to her own name, and understands the word “no.” She will cry in different ways to communicate such things as, “I am hungry,” or “I am hurt.” At 9 months, the baby will look for a ball that has rolled out of sight and will search for something hidden beneath a container or blanket. The baby’s depth perception is beginning to develop around this age. She will spend a long time observing what’s going on around her. The American Academy states that early identification of developmental disorders is critical to the well-being of children and their families. They recommend that all children should receive developmental screenings using a standardized test. In the absence of risk factors or concerns from parents or guardians, a general developmental screening is recommended at the 9-, 18-, and 30-month doctor visits. Talk to your pediatrician if your 9-month-old infant has not as yet put together simple sounds like “ba-ba,” does not sit by herself, can not roll from one side to the other and does not shift a toy from one hand to another. Also talk to your child’s doctor if she uses only one side of her body, has trouble crawling or does not crawl at all or her legs do not take on the weight of standing when assisted. At this age, if you are not lucky enough to have a baby who sleeps through the night, most 9 month olds can sleep all night without a feeding and take two naps. However, some babies, in my experience, do better with one feeding after 4 or 5 a.m. and sleep longer than not feed and get an early wake-time. I would need to know your specific situation to make a recommendation, but just recognize that all babies are different, but by this age I would not expect more than 1 feeding, typically, if any at all. Your 9 month old should be taking 2 naps per day for a total of about 2-3 hours per day plus 11-12 hours at night. If you’re having trouble with naps, you might be interested in helping your baby nap. All babies vary, but here are some rough schedules you can use to make your own for your unique baby. The first schedule is what I call a “staggered” approach. My first son did better nursing fully and then having solids a bit in between nursing sessions. He was a little hungry but not famished. He just didn’t do well with stopping nursing mid-way to eat solids. 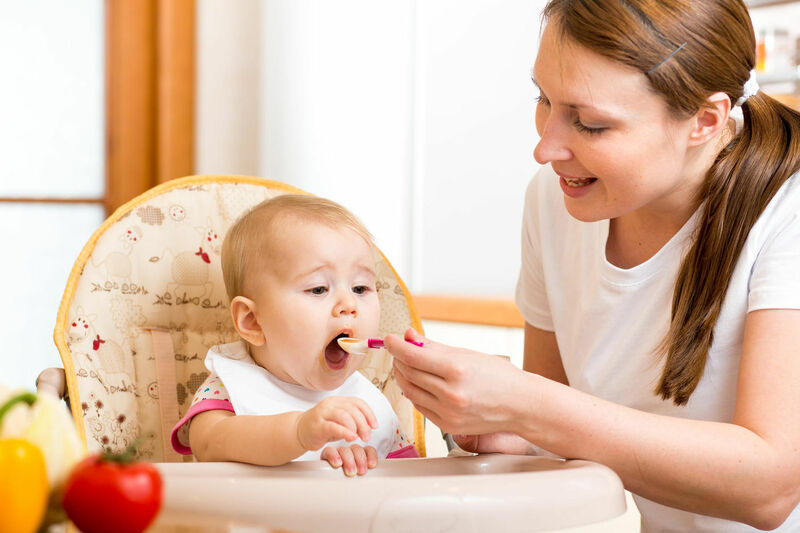 Note: When giving any feedings during your bedtime routine, be careful not to create sleep associations.